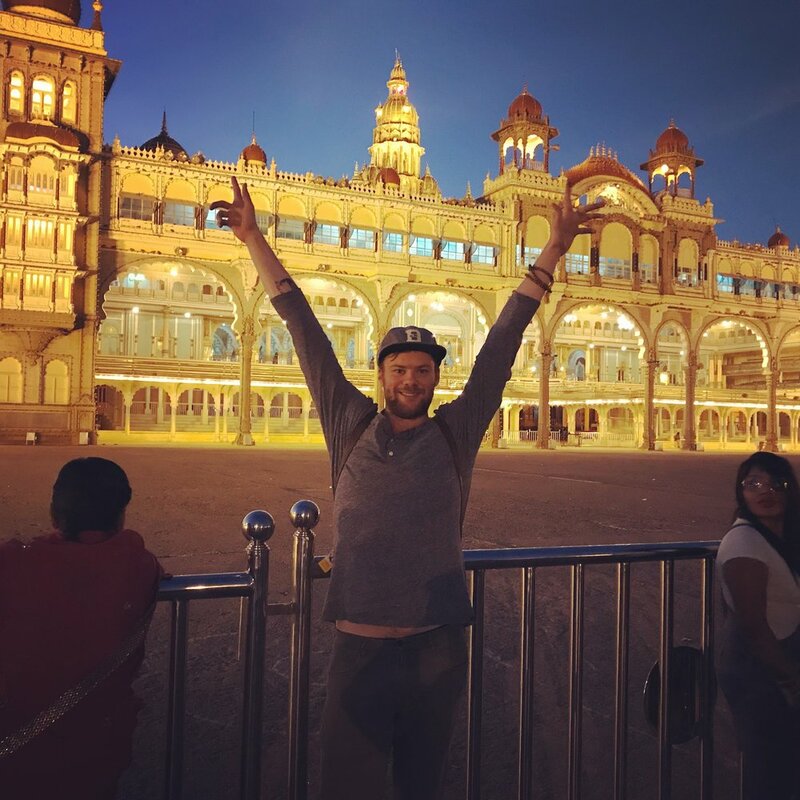 So'ham Hamsah - "I Am That, That I Am"
The Palace in Mysore, India. January 2018. So 'ham Hamsah is a Sanskrit mantra in which "That" refers to the divine spirit within us all. Search for, belief in, and expression of "That", or Soul, is what we seek through practice at Swans Nest Yoga. Yoga is a powerful practice dating back thousands of years to the Indus-Sarasvati civilization in northern India. The term yoga was first mentioned in the Rig Veda, one of the ancient philosophical texts written in Sanskrit by sages that included mantras, songs, and rituals believed to help humans connect with the divine. Today, yoga remains a practice to connect to the divine spirit through physical postures, breath work, meditation, chanting, and rituals of worship. Yoga is not a religion, and is available to anybody who seeks its teachings regardless of group identification or affiliation. Yoga is a beautiful balance of proven anatomical and physiological science, and some mysterious energy and Chakra biznass that is a bit more difficult to explain, but undeniably true through feeling. And yoga is the first thing that has opened my mind to the possibility of a universal force guiding us towards self-realization. I whole-heartedly believe that yoga is a practice which can lead to fascinating discoveries of ideas and feelings that have been yearning to shine and a connection to Soul which can aid in the process of finding purpose, fulfillment and love. Yoga is also the best antidote for depression and anxiety that I have encountered. Both conditions are extremely common, but like many mental health issues are difficult to diagnose and challenging to understand. It wasn't until I started practicing yoga that I began to understand how deeply depression and anxiety were affecting my life and distorting my perception of myself. Through the practice of yoga we can release stored emotions, reduce energy blockages in the body, alleviate depression, anxiety and stress, and ultimately help us tap into our unique Self so that we can pursue the lives we were built to live. So what's up with all the Swan stuff? Well, it's either the universe guiding me on my dharma path, or just a silly nickname I got from taking a few tokes from a swan pipe back in college. But as I delved into ancient teachings of Yoga, Hinduism, Celtic lore, and Greek mythology, I found that over thousands of years swans have been used to symbolize things such as love, knowledge, creative expression, connection to the Otherworld, the Soul, and the process of self-actualization. In 90's parlance, those things sound like "all that and a bag of chips" to me, so I'm just gonna keep flapping these swan wings and see where they take me. Also, the Sanskrit word for Swan is Hamsa, so the mantra above can also be translated as "I, myself, am the swan." I read that on the internets, so it's definitely true. I, myself, am the swan. And so are you. Peep the Classes page for where and when to practice with me. Holler if you want to chat about anything. Let's journey together. Influenced by the Baron Baptiste style of hot power yoga, this training incorporated the basic fundamentals of power vinyasa asana and breath work, yoga philosophy and teachings, and human anatomy. Scientifically-proven and globally-recognized, Katherine Roberts’ Yoga For Golfers® is a distinctly unique and proprietary yoga methodology that fuses Western biomechanical science with Eastern mind/body conditioning, applying it to every dimension of the golf swing, to drive immediate improvements in performance, right from the first tee. Yoga For Golfers® delivers results for golf enthusiasts and golf professionals of every age at every level of ability – with no previous yoga experience needed.